Whether you’re early in the nonprofit game or you’ve been in the business for a while, you know the importance of having a good team behind you. At WIB, we know this too. We’ve devoted entire blog posts to the topic of finding your “people,” because it’s something we believe plays a huge role in nonprofits. The reason is simple: your volunteers and donors work in conjunction with your staff to provide the behind-the-scenes support to your programs. Volunteers spend time assisting your nonprofit in events, sending out letters, updating information online, and many other important areas. Donors support your nonprofit with their finances, providing you the capability to support your employees and all that you do. While donors and volunteers coexist beautifully, have you ever thought of how to how to marry the two? Has your nonprofit found a way to get donors to not only give their finances, but also their time? 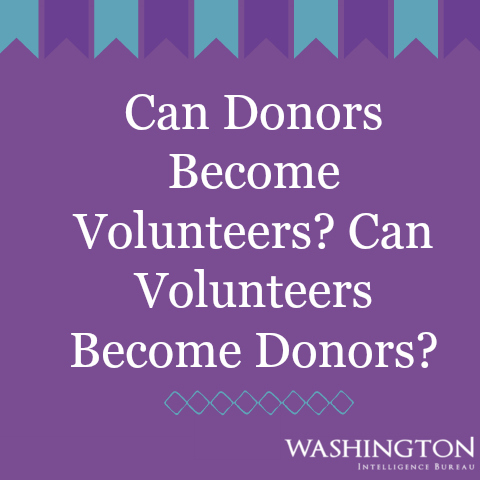 What about volunteers…have you been able to seamlessly turn volunteers into donors as well? Today, we’re diving into this topic to discuss how you can create an environment within your nonprofit where donors become volunteers and volunteers become donors. Having people be truly invested in your organization can make a huge difference in the engagement of other volunteers and donors as well as in your event and fundraising outcomes. We’re outlining five ways to blend the two into one and help your nonprofit become a place where people are invested in more than one way. While showing appreciation for both your donors and volunteers should always be done, it’s especially important when it comes to building stronger relationships. This can be done through letters, emails, events, or shout-outs in your newsletter or on social media. Make people feel like their time and finances are valued by your organization. The work doesn’t have to be easy, but the time spent donating or volunteering can be! Have your volunteer manager or community engagement staff member work on creating easy ways to get people signed up, easy ways to donate, and easy ways to see what is being asked of them. You don’t want to make people work to give you their time or money. Make it as easy as possible for them to do so. This will look different for each donor or volunteer, but think about what this looks like for your organization. Maybe this means asking for a long-time donor to volunteer on the board or asking a volunteer their opinions on how certain donation money is used. Involving people in your organization will help them feel like part of your team and can lead them to getting further involved. You can also utilize surveys either in person or via email to gauge how involved and happy your donors and volunteers are. The happier they are, the more likely they are to get involved in other ways. It’s okay to ask! If you have a long-time donor that has become familiar with your organization, ask them if they’d like to donate some of their time at an upcoming event. While they’re there, you can be sure to recognize or thank them publicly if you feel it is appropriate. If you have a volunteer that has been giving time, ask them if they’d be willing to help you with your campaign. This could mean asking their friends and family in person or on social media to donate. Asking them to be involved in efforts they’re usually not involved in may surprise you! After all, they are giving time or money to your organization for a reason…because they believe in you. Knowing your volunteers and donors personally is the only way to create these relationships that extend past their normal involvement. Getting to know your volunteers and donors and their interests, jobs, and lives can give you the opportunity to know when to ask. You can also use this information to see if they have friends, family members, or coworkers who would be willing to get involved in your organization. Knowing their skills will also come in handy. For example, if a donor is also in finance, you may ask them to donate time at a register during an event. Knowing their skills and interests will make it a positive experience for them no matter if they’re giving money, time, or both! Treating your people well will help your nonprofit continue to grow and achieve the goals that have been set. You don’t have to settle with people either being volunteers OR donors. Take a look around, do regular assessments, and make sure that you’re utilizing your volunteers and donors in ways that reflect their interests and want to get involved. Treat them kindly and make them feel like part of your team. After all, they can support you in more ways than one! Has your organization successfully transitioned donors to volunteers or vice versa? We’d love to hear how!